Humans have at least 5 basic senses that we use to interact with the world around us: sight, smell, touch, taste and feel. Many things stimulate more than one of ours senses. For example, we can see the light of a bonfire before hearing the crackle of flames or feeling the heat on our skin. The more senses we use to study an object, the better we can understand it. When it comes to studying space, we’ve always had to rely on light coming from distant objects. But last year, we achieved a new way to detect or “sense” events in the Universe. We can feel ripples in the fabric of the Universe itself! These ripples are called “gravitational waves”. They were first suggested by Einstein 100 years ago, but we didn’t have the advanced technology to identify them until last year. These gravitational waves were created by black holes colliding. Black holes are stars with an unusual characteristic: their super-strong gravity swallows-up light. This makes it impossible for telescopes to see them, we needed a new way to detect them. On 17 August 2017, we detected gravitational waves for the sixth time. But for the first time, the event responsible for creating these waves were visible to telescopes, too! What’s more, the signal was like nothing that had ever been seen before. Yet the source was unmistakable. It was an event scientists had been waiting to see for a long time: two neutron stars spiraling closer and closer, before crashing violently together. 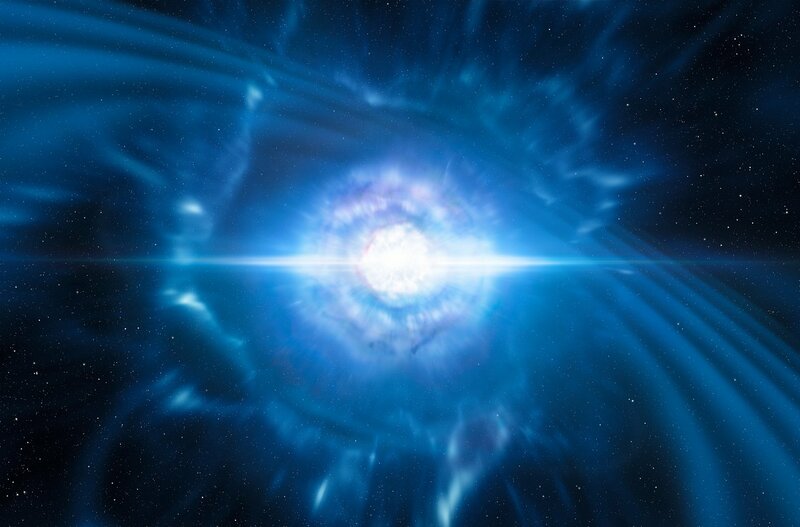 This new type of explosion is called a "kilonova" (pronounced KEE-lo-nova). Neutron stars are abnormally small and dense objects. Unlike black holes, they give off light. This has made it possible to study the explosion using different telescopes all over the world, as well as gravitational waves. For the first time in history we were able to see and feel an event far away in the cosmos! Scientists think that most of the gold on Earth may have been created in a kilonova explosion. This is a kids version of ESO Press Release eso1733.